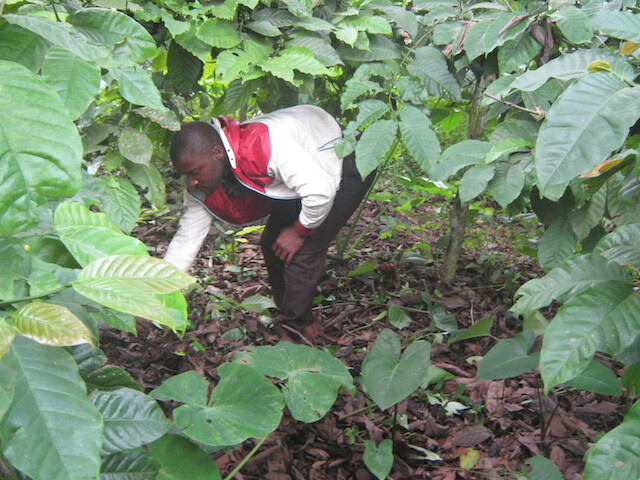 KOUOPTOMO, Cameroon, Aug 5 2014 (IPS) - Issah Mounde Nsangou combs his 6.5-hectare Kouoptomo coffee plantation in Cameroon’s West Region, pulling up unwanted weeds and clipping off parasitic plants. For the 50-year-old farmer, the health of his coffee plants are of prime importance. “I have to prune the farm to make it neat. This will obviously yield good gains,” he tells IPS. Kouoptomo is traditionally a coffee farming village, but like other production basins in this Central African country, production has been on a continuous decline. Twenty years ago, Nsangou would harvest about 4.8 tonnes (about 80 bags) of coffee from the land. Not anymore. “Last year, I did not even harvest up to 20 bags,” he says. Coffee contributes about six percent to the country’s GNP and constitutes a lifeline for some 400,000 farmers. The current efforts are intended to raise production to about 120,000 tonnes by 2015. Coffee production in Cameroon has been plummeting over the years, falling by 56 percent in 2013, with farmers harvesting a mere 16,142 tonnes. It was a dramatic decline from the over 38,000 tonnes harvested the previous year. But the 2012 harvest only represents a third of the 1986 harvest of 140,000 tonnes, according to the Interprofessional Council for the Cocoa and Coffee (CICC) in Cameroon. Omer Maledy Gaetan, executive secretary of CICC here, points out that Cameroon used to be one of the biggest coffee producers in the world. “In 1980, we were ranked the 8th [as a] world coffee producer. In 1992, when we liberalised the sector, Cameroon was ranked 12th in the world. Today, we are ranked as 30th,” he tells IPS. The reasons for the downward trend are many and varied. According to Gaetan, the costs of inputs like fertilisers spiked in the wake of the government’s decision to eliminate subsidies and price protections for the sector in the 1990s. The increased costs of production, coupled with low market prices at the time, discouraged farmers, many of whom turned to food crop cultivation instead. “Without fertilisers, insecticides, fungicides and sprayers, it was hard for many farmers to sustain their farms,” Nsangou says. In addition, farmers complain that erratic rainfall and the absence of technical advice from extension services have combined to hampered the sector. Still, many are returning to their farms, despite the setbacks. With world demand for coffee rising by about three percent every year, Cameroon is now looking to revive the once-thriving sector. The CICC has launched a project known as “New Generation”, which to attract youths into a sector currently sustained by ageing farmers and ageing farms. He says the objective is to create 3,600 hectares of coffee plantations in six years. “We will supply farmers with everything they need, except labour,” he says. He says the first three years will focus on creating 2,200 hectares of coffee plantations in the production basins of the Upper-Nyong in East Region; Moungo, along the coast; and Noun in West Region. 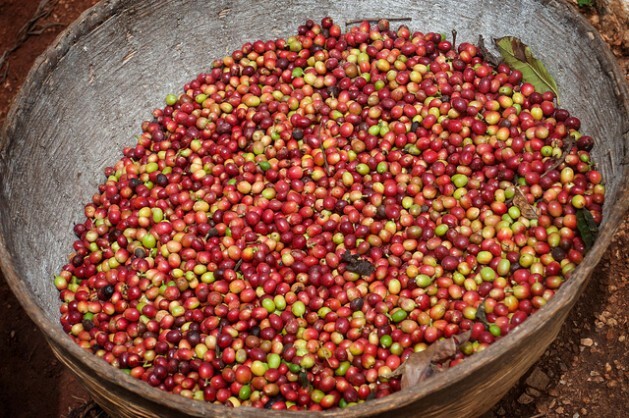 According to the Minister of Agriculture and Rural Development Essimi Menye coffee remains a key crop that could contribute to Cameroon’s planned development by 2035. It contributes about six percent to the country’s GNP and constitutes a lifeline for some 400,000 farmers. He says the current efforts are intended to raise production to about 120,000 tonnes by 2015. Still, current efforts to boost production may not adequately benefit farmers if added value is not brought into the sector. The CCIC says only five percent of Cameroon’s coffee is transformed locally, thereby depriving farmers of a significant mark-up in income. “Value-addition is the best thing that can happen to coffee farmers and the coffee sector,” Peter Fonguh Minnang, marketing director of the North West Cooperative Association — a farmer’s cooperative involved in coffee marketing, tells IPS. “If we can transform our coffee, the farm-gate price will automatically go up, because if a kilogram of parchment sells for CFA 500 [about one dollar], we will be paying the farmer at least CFA 1500 [about three dollars] for the same parchment when [value is added],” he explains. Recently I have been avoiding a lot of produce and fruit because I see very clearly the effect that non-organic, pesticide laden, products have on how I feel. What a wonderful opportunity for this region to take advantage of, economically induced, reduction in pesticides to rebuild the sector with substantial pesticide-free farming. I hope the leaders and other interested parties are able to appreciate the opportunity. I will be looking for my organic coffee to come from here soon.